Several AppleInsider readers have reported the line indicating the current time is displaced by one hour in the calendar app —for example, at 12:15 p.m., the calendar app draws the "current time" line in the slot for 1:15 p.m., despite displaying the correct time beside the line and in the system notification bar. 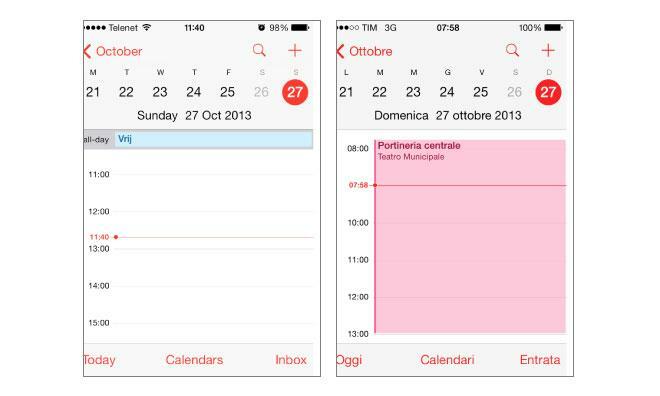 The bug reportedly does not affect scheduled alarms or calendar events, the times for which are adjusted properly. Time zone support is a recurring issue for Apple's software and operating systems. In 2010, iOS 4 contained a bug that did not properly shift alarm schedules when Daylight Savings Time ended, causing some European iPhone owners to miss appointments or wake up late for work, while Australians were woken up early. In 2011, another iOS 4 bug caused non-recurring alarms to be disabled when clocks ticked over to January 1, 2011. Apple eventually fixed both issues.